Rose Coschignano/Pipe Dream Photographer Members of the Women’s Student Union kick off their “Take Back the Night” rally by leading a march in Downtown Binghamton on Friday. 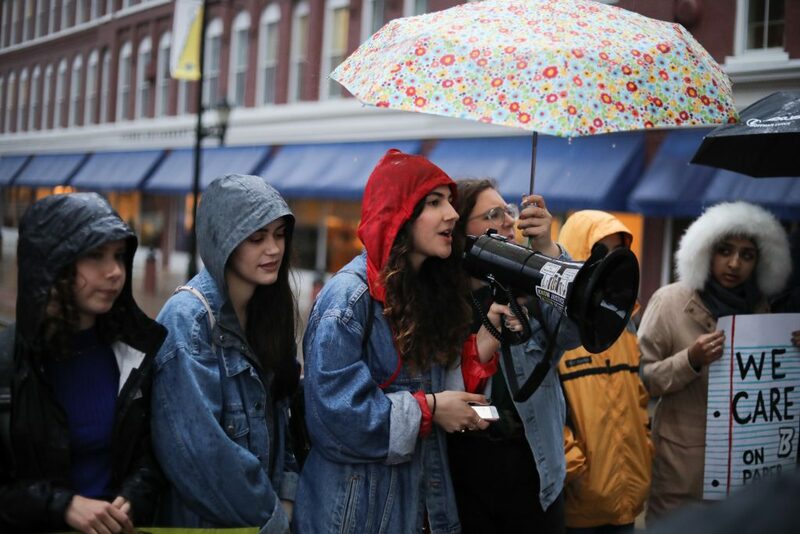 Leading more than 50 people on a march through Downtown Binghamton on Friday night, the Women’s Student Union (WSU) held their seventh-annual “Take Back the Night” rally at Atomic Tom’s. “Take Back the Night,” an international rally held annually, is also the name of a national nonprofit organization that aims to spread awareness about sexual assault and violence on a global scale. Every year, WSU hosts a “Take Back the Night” rally in Downtown Binghamton consisting of guest speakers and a “survivor speakout,” allowing anyone to share their experience with sexual violence or assault in a safe space. Erica Prush, president of WSU and a senior at Binghamton University majoring in English, wrote in an email that the WSU had been preparing for the event for months. Three guest speakers from local organizations — Rise, Family Planning of the Southern Tier and the Crime Victims Assistance Center (CVAC) — addressed the crowd, providing information about the goals of their different organizations and insight into the overall ambition of Take Back the Night. Rebecca Staudt, manager of advocacy services at Rise, a local nonprofit organization that works to aid those affected by domestic violence, said the event is not only about discussing the statistics of domestic violence and sexual assault that occurs throughout communities, but also about starting a dialogue on how to empower women. After attending the rally, Emma Marlowe, a junior double-majoring in sociology and English, said she felt the event deepened her knowledge of domestic violence and sexual assault and helped her understand why activism can be so impactful for communities. Prush said the efforts of the rally tie to WSU’s efforts to promote awareness surrounding women’s issues at Binghamton University.